I’m going to be real here: postpartum fitness is a struggle. Before I was pregnant, I would regularly take hour-long yoga and barre classes, and I had the time to train for half and full marathons, too. It was easy to schedule in my workouts because I had a lot more free time. Now, I’m lucky to fit in a 20 minute at-home workout. Not only is it hard to find time to work out, but it’s also been tough getting back into shape physically. I didn’t feel up to doing hard workouts when I was pregnant, and my C section kept me from doing tough workouts for a while after having my baby. I’m honoring my body and taking things slowly as I get back into shape. But as I ramp up my fitness routine, I’m definitely getting some sore muscles. Warm up and cool down. It’s easy to skip over a proper warm up and cool down, especially if you’re crunched for time. But, they’re essential to make sure your muscles are ready for your workout. Making sure your body’s ready for your workout can mean less soreness after your workout. Keep moving. I’ve learned this one the hard way after running longer races. It’s tempting to just sit down and relax for the rest of the day after a hard workout. But, not moving your body can actually make you even more sore. Just moving around the house will help keep the blood flowing through your muscles, which will help keep you less sore. Do some self massage. Your foam roller is your friend. Self massage helps to keep the blood flowing through your muscles, and it helps break up muscle adhesions, too. All of that not only helps you recover more quickly, but it helps your muscles feel better, too. Fuel for recovery. Refueling the right way after a workout can definitely help combat soreness. Try to get in a little protein after your workout. Even better, get in some BCAAs (branched-chain amino acids). BCAAs will help you recover faster, and can help you feel less sore. Use a topical pain relief product. There are some great topical products out there to help you relieve muscle soreness. One that I’ve been using for years is Biofreeze®. In the past, it’s helped me work through my soreness after long runs and races. Now I’m using it to relieve the soreness that’s come with getting back in shape after baby. I’m committed to getting stronger and building more muscle, and Biofreeze® is helping me do that without as much pain. I’ve always just put it on where I feel sore, but for this post I wanted to do some testing. 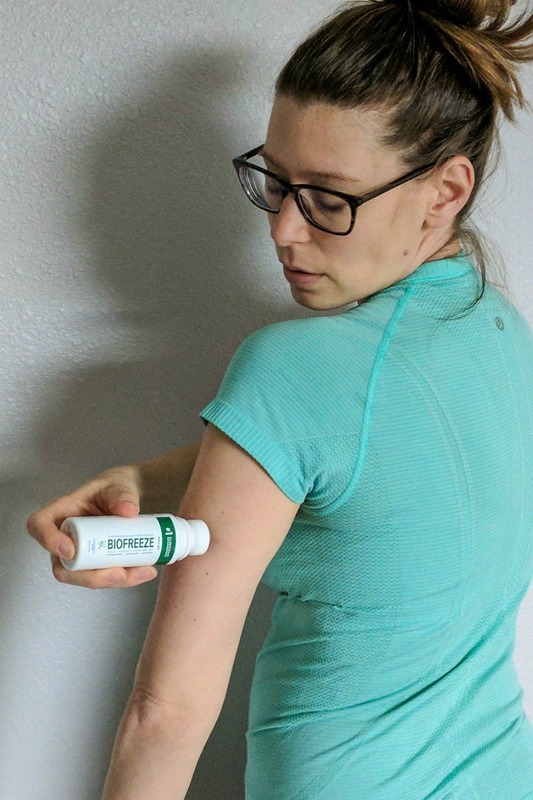 I put Biofreeze® on one side of my body after a hard work (upper back and tricep) and left the other side alone. I definitely noticed a difference in soreness. 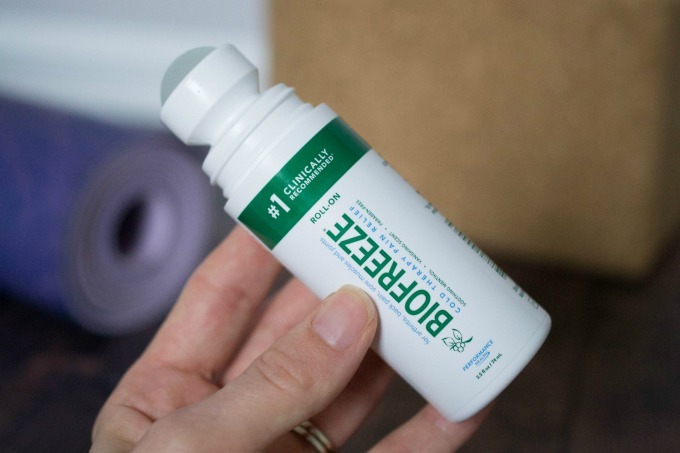 It was easier for me to move the side that I’d used Biofreeze® on, and my muscles didn’t feel sore at all. The difference was even noticeable hours afterward. 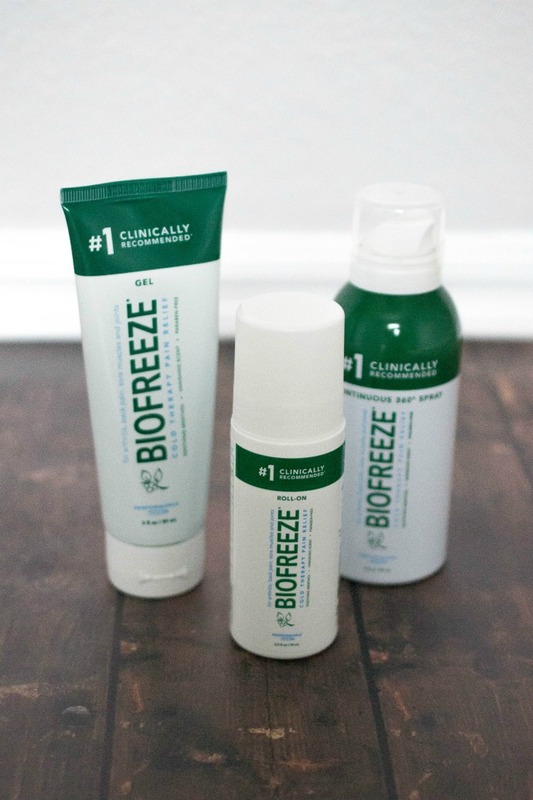 I love Biofreeze® because unlike some other topical pain relief products, it doesn’t contain NSAIDs (non-steroidal anti-inflammatory drugs). NSAIDs reduce the body’s natural inflammation response. That inflammation tells your muscles to get stronger, so you need that to see the fitness and muscle growth improvements you’re hoping to get from your workouts. Plus, the pain relief stays right at the spot where you need it, and doesn’t go where you don’t need it, unlike a systemic pain reliever like naproxen or ibuprofen. Why is Biofreeze® so effective? It contains menthol, which provides a cooling sensation (think icing the sore area without the mess). That cold sensation helps relieve soreness so you can get back to moving like your old self. The menthol in Biofreeze® is USP (United States Pharmacopeia) grade, which means that you’re getting a high-quality pain relief product. And, even though Biofreeze® is great at relieving muscle and joint soreness, you don’t need a prescription to get it. I’ve used the gel in the past, so I was excited to get to test out the continuous 360° spray and the roll-on. The spray made it really easy to use on hard-to-reach areas like my back. I really loved the roll-on because I didn’t have to get my hands messy. I probably would have just continued to use the gel because it’s what I’d used in the past, but I think I’ll be switching over to the roll-on in the future. 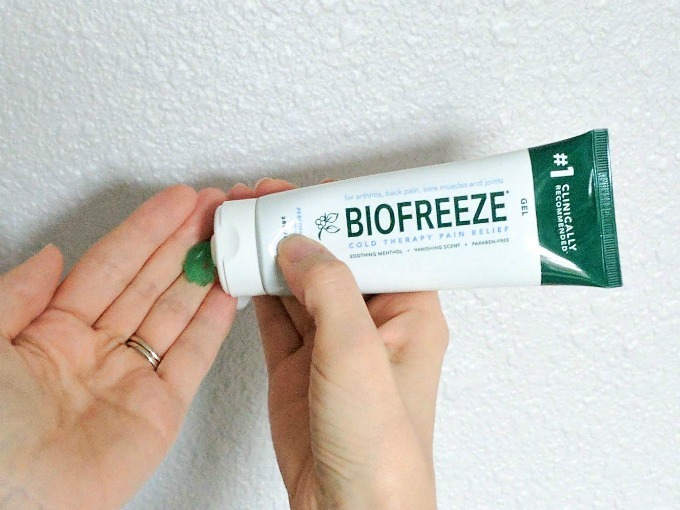 Want to try Biofreeze® but you’re not sure how to get it? It used to be tough to find, but now you can find it at major retailers like Target, Walmart, CVS, and Walgreens. Check out their store locator to find where you can get it near you! I LOVE Biofreeze! It’s was a staple for me during Marathon training. I recently found it at my local supermarket! I love Biofreeze! I’ve been using it for years! It’s nice that you can apply it directly to the sore muscle instead of taking ibueprofen and the effect is almost immediate!